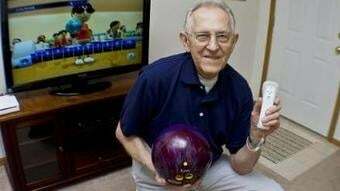 He has bowled more than 2800 perfect games in Wii Sports bowling, which makes 85-year-old John Bates a world record holder. Impressive, sir. The newest video game edition of the Guinness Book Of World Records recognizes Wisconsin-based Bates as the holder of the record for "Most Perfect Scores Achieved on Wii Sports Bowling" according to Minnesota's Star Tribune newspaper. A perfect game in bowling is a game that consists entirely of strikes. The paper reports that Bates is already up to 3200 perfect games, though he's being careful not to binge by limiting himself to no more than 21 games a day. We all knew that the Wii was popular with elderly people, but who knew that the old folks could be so good at it?